ROCKFORD, IL — For 19 weeks in 1978, a local new/used car dealership was said to be brimming with “record numbers of walk-in customers,” all because of a weekly super hero newspaper cartoon advertisement featuring a caped car salesman! It all began after local ad legend Terry R. Gossell approached the Captain with this unique, one-of-a-kind project, for a specific car dealer. Within days, VA-ROOM! “Super Swede” was born! The title character represented “Swede” Clark, the dealership owner, who transformed into “Super Swede” by inserting a car key into his magic belt buckle. Drawing on his comic book story-telling knowledge, Captain Cartoon plotted and wrote each strip — up to the last panel — where Ms Gossell added the all-important sales message. The entertaining cartoon story, combined with those sales messages, worked, and Super Swede’s newspaper comic was the talk of the town! Kids and families gravitated to the super hero, who was portrayed in real life by a 7-foot-tall costumed actor. Billboards, T-shirts and TV/radio commercials were produced, launched and aired — all culled from the actual strip. A “circus atmosphere” prevailed during the entire ad campaign. But there’s even more to the story: “Super Swede” went on to be awarded the prestigious “Best Newspaper Ad Campaign in 1978” honor by the Northern Illinois Ad Council. Why did Super Swede work so well? “It stood out on a classified ad page, where it appeared in the local daily each week,” says the Captain. “I intentionally focused on a good, entertaining story ‘with payoff,’ while Terry wrote the final words,” he says. For more on comic strip advertising, visit the Captain’s official website. One of 19 weekly comic strips which served to sell Toyotas for a local dealership. Captain Cartoon’s Latest Cartoon Billboard is Up as He Launches Online Drawing Lesson! PORT SAINT LUCIE, FL — When Captain Cartoon draws a political cartoon, people usually notice — and his latest cartoon opinion is no exception! Measuring 37 feet by 10 feet, this full-color monstrosity can be seen in all its glory on US 1 in Port St. Lucie! The political cartoon billboard ranks as the Captain’s biggest ever (size-wise) — and was drawn in support of the local police department in its ongoing layoffs dispute with the city council. It caricaturistically lampoons local pols over perceived city misspending, and comes on the heels of two other “major” political cartoons produced by the Captain as billboards, all targeting “spend-crazy” politicians in West Palm Beach and Alachua County, Florida. One of the Captain's first political cartoons published in 1969. He was 16 years old when this sketch was penned with a felt-tip. 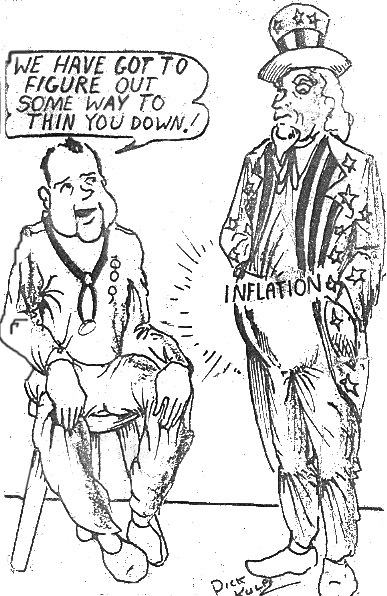 Uncle Sam looks more pregnant than fat here. school paper, and on December 25, 1969, they began appearing in his hometown weekly. The Captain’s oft-favored subject: the local police. This would earn him his first parking ticket in 1971. In 1977, One of the cartoonist’s most infamous sketches “inadvertantly” targeted the local police department, showing officers “on an emergency run to a local donut shop.” Originally produced as part of a comic strip series in 1976, the strip was re-published in the Captain’s local newspaper following his election win as a city alderman. Unaware “that” particular comic strip was published that week, the Captain became aware in a hurry after TV, radio, newspapers — and cops — began calling him. Comic strip from the series "Double Eagle & Co." published originally in the Freeport, Illinois Journal Standard in 1976. The Captain eventually re-drew the strip and published it in Petersen Publishing’s famed CAR-toons Magazine 1n 1987. Within months of the “Donut Debacle,” the Captain produced a series of cartoons targeting his city’s then-newly appointed police chief, whose financial and procedural dealings ran afoul of several city council members. After causing the local newspaper to do an “about face” from its initial support for the chief, these led to the appointment of a new chief nearly a year later. “Essentially, these cartoons ran the guy out of town,” he quips. Cities very rarely — if ever — beat an EPA fine. This was a first. Captain Cartoon would go on to produce “cartoon campaigns” for a variety of causes, culminating in two separate cartoon booklets, both of which generated headlines around the country in 1985 and 1986. One effort gained the endorsement of the then-Chairman of General Motors as well as the Governor of Illinois. In an effort to spark a renewed interest in the field of cartooning and cartoon promotion, the Captain has revamped his website’s “Fun Zone” as the Captain’s “Cartoon Chest,” featuring coloring pages, learn-to-draw lessons and his own intellectual property features, past, present and future. He’s also ramped up his “history” page, and lists his major cartoon accomplishments on a political billboard cartoon promotion page. Captain Cartoon is a caricature artist in South Florida. You can see his work here. Captain Cartoon’s third political cartoon billboard has just been unveiled in Port St. Lucie. Cartoon illustrations can be VERY effective in advertising! Times are tough (and getting tougher) — so it’s more important than ever to keep those lines out and hooks baited fishing for customers. One key way is through comic strip and static cartoon advertising! But I don’t do nearly as many as I should, and I see too few samples of others. The biggest problem? Not much demand.THAT’S primarily due to “unfamiliarity” with cartoon/comics as ad vehicles. In a future post I’ll get into the nuts and bolts as to “comic strip advertising”, but results truly speak louder than words…and I’ve posted some substantial results on my website (Linked to image at bottom). So for those folks looking for unique ways to market their stuff — or for writers and artists looking beyond the comics industry — think about cartoon/comic strip advertising…I suspect you’ll be glad you did. Just one thing…the cartoon ads mentioned above are all billboards — and response — as usual — is tremendous. It’s an art. Stay tuned!